SHRM Tech ’17, the 3rd edition of ‘SHRM India HR Technology Conference & Exposition’ began yesterday at the Novotel Hotel in Hyderabad. Society for Human Resource Management (SHRM) is the world’s largest association devoted to human resource management. With 850+ delegates from over 400 organizations in attendance and an equally enthusiastic participation from Certified Human Resources Executives (CHRE) and global HR experts, the annual SHRM Tech Conference has emerged to be Asia’s fastest growing HR tech conference. The event formally kicked off with an engaging welcome address by Ms. Achal Khanna, CEO of SHRM India. In her welcome address Ms. Khanna emphasized on the need for HR professionals and corporate leaders across industries to come together under a common platform to identify and engage in a discussion of innovative ideas and technologies revolutionizing the future of HR. It was followed by vibrant sessions and panel discussions where some of the eminent speakers including Josh Bersin(Principal, Bersin by Deloitte, Deloitte Consulting LLP); Jeff T.H. Pon (Chief HR & Strategy Officer, SHRM); Alexander Alonso (Sr. VP, Knowledge Development & Certification, SHRM); Sarika Khanna (SVP Product and Services – Litmos by CallidusCloud); Sreekanth K Arimanithaya (Sr. VP iWFM& Co-MD India, DXC Technology); Anuranjita Kumar (MD, CHRO, Citi South Asia); Rohit Bhayana (Managing Partner & Co-Founder, Lumis Partners) shared their insights on the growing trends and the need of technology in HR. In his key note address ‘HR Tech Reinvents Itself’, Josh Bersin highlighted the reinvention of HR Tech and delivered key insights on how to develop an effective digital HR strategy for the future. He further emphasized the need for focus on ‘employee experience’ and usage of tools such as design thinking to understand employee needs. Bersin also said that it is the responsibility of HR to focus on employee wellness and well-being and therefore choose technology that facilitates it. Achal Khanna, CEO, SHRM India, said, “From sharing deep insights into developing a HR strategy to understanding ethical uses of big data and understanding a future scenario with artificial intelligence, and product and report launches, the first day of SHRM Tech ’17 was a truly productive session. I am sure the knowledge and understanding gained from the insightful talks and panel discussions will truly help us understand HR better and promote awareness around the various technological interventions available, to help us in our pursuit of excellence in HR practices. SHRM is thrilled by the continued success of this annual conference and we will endeavor to present a platform where the best minds in the industry can discuss and debate on evolving trends, issues, and challenges.”. Twonotable launches were made during the first day of the conference. 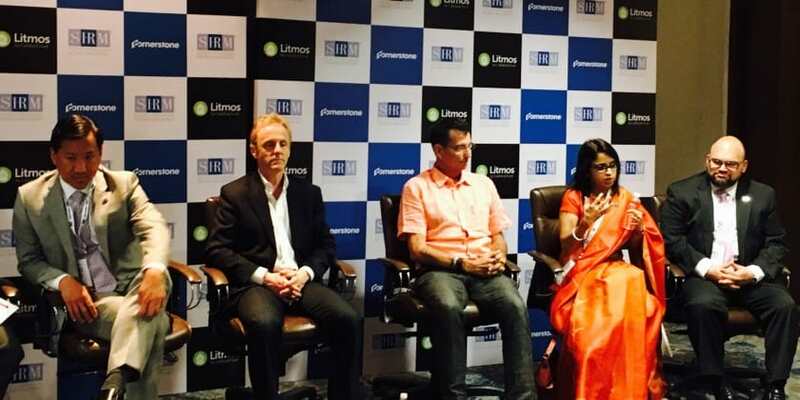 First one being the product launch of “Litmos by CallidusCloud”, aimed at creating a new category known as Learning Automation. Litmos will put learning at the center of the workflow, automate daily tasks and can be deployed across all channels and devices. Whereas the second important launch at the conference was –“Habit Forming Cloud & Mobile Platform in Supporting Employee Wellbeing: An India Study, 2017 by SHRM and Zoojoo.be”. This study is the first of its kind in India making it a truly unique and relevant report. According to this report, a strong evidence has been found that healthy habit forming platforms help reduce workplace stress and further improve job satisfaction as well as organizational commitment in employees. In an engaging Panel discussion: Big Data – Dr. Jeckyll or Mr. Hyde,panellists – Rajan Kalia, , Salto De Fee; MaduRatnayake, Exe. VP, CIO, VirtusaPolaris; Atul Hegde, Co-founder, Rainmaker Ventures; Anuranjita Kumar, MD, CHRO, Citi South Asia about some of the successful use case scenarios and the governance mechanism that should be built around big data usage in organizations. A report titled “SHRM India’s Top 20 HR Influencers on Social Media”was also launched in the course of the day. The report highlights the top influencers in the increasingly powerful medium that is social media. As an increasing number of people embrace social media, corporates have found a new tool in social media as a business and HR tool. The first of the two day event also saw a series of panel discussions, special talks, and concurrent sessions on topics ranging from performance management to ensuring productivity. The event also presents the perfect opportunity for networking amongst HR practitioners and HR solutions providers. The final session for the day involved conjuring magic to help improve people practices in organizations.